In the 1970s Britain was saturated in political activity right across the board. Not just in the Labour movement, trade unions and the Left but also the new social movements were particularly active in challenging the oppressive established order especially the black, women’s and gay liberation movements. The environmental, countercultural, squatters’ and claimants’ organisations were also fully engaged in defending people against poverty, homelessness, the destruction of the environment and experimenting with ‘alternative’ lifestyles. Throughout this period the anti-apartheid movement, the Anti-Nazi League and Troops out of Ireland challenged the racist regime in South Africa, the growing menace of racism and fascism and the continuing military occupation of Northern Ireland. In the early 70s there were still lively anti-Vietnam war demonstrations. Much of this ‘crucible’ of radical activity provided the ingredients for how politics were practised locally in Brixton. 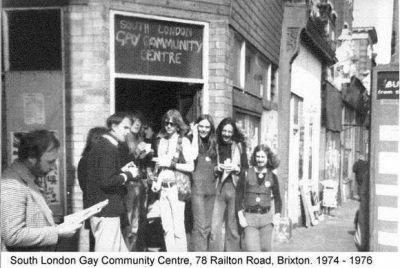 This guided tour, conducted by Ian Townson, will concentrate on the radical gay community and gay squats in and around Railton Road from the mid 1970s to 1981, the year of the Brixton riots, but will also include many other groups active in the area. Also there will be an account of more up-to-date contemporary events. Join us for an exciting and illuminating voyage of discovery to uncover the lost aspects of the past that have become ‘hidden from history’. Will there be political lessons to be learned from the past of benefit to us now or will this just be an exercise in nostalgia and fond memories? Come along and judge for yourselves.